Assisted by the likes of Henry Cooper, Barry Sheene, Paul Gascoigne and Kevin Keegan, men's fragrance “Brut” achieved international prominence and for several years in the late sixties was the UK's biggest selling aftershave. Eventually, sales began to fall off as the fragrance was particularly distinctive and no one wants to arrive at a nightclub smelling exactly the same as everyone else. In an effort to regain lost sales Fabergé, Brut's owners at the time, introduced a budget product called “Brut 33” which contained only 33% of the fragrance of the original and was packaged in cheaper plastic bottles. It sold reasonably well but the perfume's lighter notes were equally distinctive but a bit 'cheaper' which, unfortunately, resulted in Brut 33, marketed by the company as "The Essence of Man" becoming known as “The Smell of Desperation”. 'Nothing ventured', however, and the company continued to market the product hard and, in this country, motor racing played a large part in their plans. With saloon car racing becoming incredibly popular it was an obvious choice. Stuart Graham in his Brut 33 sponsored 'Group 1' Z28 Camaro featured strongly in the British Saloon Car Championship (now Touring Cars) during 1974 and 1975 much to the delight of Fabergé who noted a marked increase in sales. Their motorsport involvement continued in 1978/9 when respected Touring Car engineer, Ted Grace in Pershore, was commissioned to build a couple of 3.0S Capris to contest the BSCC, driven by Stuart Graham in England and Bernard Largier in Belgium and France. Offered here is an exacting copy of the Fabergé Capris built to the ultimate new British Touring car FIA specification. Instrumental in the visual build was an ex-Ted Grace employee who luckily had retained a lot of the original drawings and photos. Mechanically this Capri has been built to the ultimate specification with input from leading engineers and a current top touring car ace. Using the best available Capri 1.6 base car available, as were the original Grace cars, it was dipped, seam-welded and sent to Historic Race Car Preparation to have a period-correct T45 roll cage fitted exactly like the original cars. It was then re-dipped and the complete shell with roll cage was powder coated. 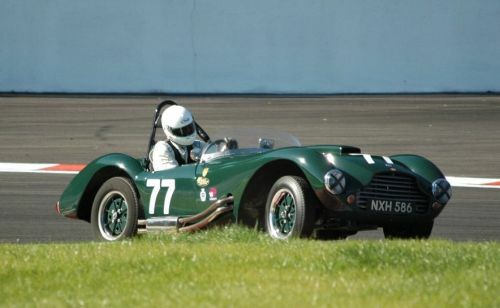 The exacting build included a Rik Wood, state of the art, 3.0-litre Group 1 engine producing 300+ bhp which has been MSA inspected and sealed as per Goodwood, Motor Racing Legends and Tony Dron Trophy regulations. It has a straight-cut, close-ratio, Quaife 4-speed quick-shift gearbox and freshly rebuilt ZF limited-slip differential. The front and rear suspension utilise the latest Proflex units developed for the new FIA Historic Series. The final paint finish was applied by renowned specialists 'Prospray' in Cheshire to a level of perfection usually unseen on a historic racer. The detail and paint codes are absolutely accurate to the original using, uniquely, the original press car as a reference. When finished it was found to be below the weight limit and is one of the lightest Capris built requiring ballast which can be advantageously placed. 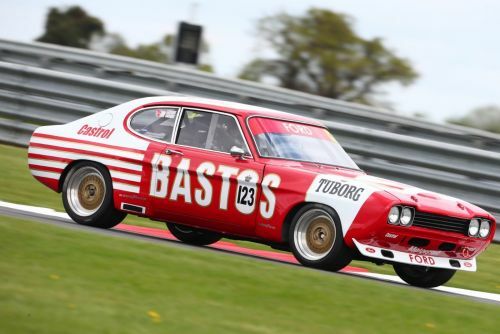 After obtaining new FIA Historic BTCC papers in August 2017, it was entered in a round of the Classic Touring Car Club 'Group 1' race at Brands Hatch qualifying on pole and winning the race. Two weeks later at a wet Thruxton, another win followed. A mechanical issue robbed the Capri of a podium finish at Silverstone. In addition, the Capri has had an outright win at Croft and was third in class at the this year’s Silverstone Classic. Since then with the help of current touring car ace Tom Ingram, the team have started a program of closed season testing to ensure this is the most competitive Capri. Currently, an entry has been submitted to Goodwood for an invite to the 2019 Members Meeting and Tom Ingram would be interested in sharing with a new owner. This car is eligible for all forms of historic touring car racing including the Goodwood Members Meeting, Tony Dron Trophy, CTCRC Group1, Peter Autos etc. Silverstone Auctions are proud of their track record selling Group1 Capri’s and this iconic liveried Capri is probably the best presented of all.